I've already started planning our winter storytime sessions (kicking off the first full week of January here) and, for me, the hardest part is trying to come up with an art or craft activity that is simple enough for the littler ones and yields a decent result without having to buy materials. So I decided to make my own craft for some of the weeks. Here's my first effort: a simple snowman, which is still a little tricky for the little ones to cut for themselves. I know there is a philosophy out there that it's better for kids to have open-ended art activities than to have "copy this" adult-directed crafts and I agree with that, but for a lot of reasons, I'm not sure my storytimes are the best time and place for that. I'd love to offer an open art studio program in the future sometime. Maybe during summer reading? It's tricky for me because the county arts council is mere steps away from my library and I don't want to step on their kids' programming toes. You can download this craft for free from my Teachers Pay Teachers store. 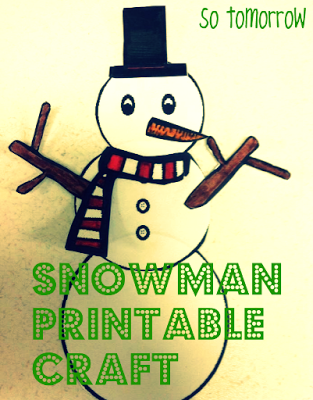 Printable Snowperson Craft by Anne Clark is licensed under a Creative Commons Attribution-ShareAlike 3.0 Unported License.